The Alien. Xenomorph, monsters, the Beast, nasties, Linguafoeda acheronsis, Internecivus raptus, Xenomorph XX121… Our favourite extra-terrestrial Starbeast has been known by several different names over the decades but without a doubt the moniker of Xenomorph is probably the most common. First used by Lieutenant Gorman during Aliens, Xenomorph is actually something of a misnomer. Instead the Aliens are known informally as “Snatchers” which no scientific name given to them. The book does give the face-huggers a real name, though – Manumala noxhydria, which translates to the evil hand, the jar of night. The term xenomorph could apply to any unusual creature and I would suggest is a generic term used to describe unknown or unclassified creatures – something I think the Weyland-Yutani Report and Aliens: Sea of Sorrows supports with the addition of the label XX121, suggesting that perhaps many other alien lifeforms have been classified as xenomorphs under specific labels. The anthology book Aliens: Bug Hunt also supports this. The book features many different aliens and in one particular short, Distressed by James A. Moore, the unknown alien creature in that short is also referred to as a xenomorph. In addition to Xenomorph, the Aliens have also been known by several scientific names or more specifically Binomial names. The most prolific of which is Linguafoeda acheronsis. Coined by and used exclusively by writer Mark Schultz Linguafoeda acheronsis, which translates to “foul tongue of Acheron”, was first introduced in 1997 with the release of Aliens: Havoc and said by Gropius Lysenko. Gropius Lysenko was described as a brilliant biochemist who originally worked for Neo-Pharm and was eventually hired by Weyland-Yutani. He was well known for his experimentation with consciousness-altering substances. He was researching the psychoactive properties of substances derived from the Alien’s Royal Jelly – specifically genetically engineering the royal jelly in an attempt to make the Alien consciousness understandable to humans with similar psychic abilities. Eventually, he discovered a way to use these substances to separate his consciousness from his physical body and was even able to enter and take over other people’s bodies. I wont turn this article into a breakdown of every single series Linguafoeda acheronsis was used in but Aliens: Havoc is one of the braver Alien series and it tries to do something different with the story and the art-style. I’d recommend giving it a read. The term Linguafoeda Acheronsis would re-appear in Schultz later Alien series, Aliens: Apocalypse – The Destroying Angels (which is one of my personal favourite comics), Aliens: Once in a Lifetime and Aliens vs. Predator vs. Terminator. In 2003 the name Internecivus raptus would also come to be associated with the Aliens. Internecivus raptus, which translates as “murderous thief” was first featured in the menus of fantastic DVD boxset the Alien Quadrilogy. Internecivus raptus was coined by Charles de Lauzirika, the producer behind the amazing Alien Quadrilogy and Alien Anthology boxsets, as a fun easter egg. The name Internecivus raptus would only extend past the Alien Quadrilogy with the release of a gorgeous Sideshow statue that was simply titled Internecivus raptus. Sideshow also gave their Alien King statue the alternate name of Internecivus raptus rex. Outside of these instances, the name Internecivus raptus has never been used. 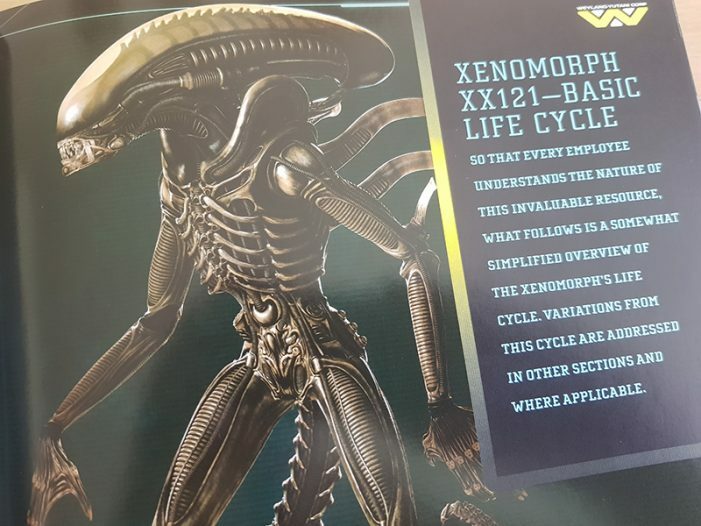 Personally, I’m not a huge fan of just the term Xenomorph but with the XX121 label and the assumption that Xenomorph is just a generic term used for extra-terrestrial creatures that haven’t been classified I’m kind of okay with that. I typically just like to call them Aliens. Gorman had called it “a xenomorph” refering to “strange shape” or unclassified organisms, I think the XX121 could either refer to the alien being the #121 unclassified lifeform or 121 being the year of discovery, Because W-Y knew of the creature before they sent the Nostromo, isn’t difficult to assume they had discovered the signal the year prior (2121). The fact that everyone keeps calling them Xenomorphs has always bugged me. Gorman does not call “them” Xenomorphs. He has no idea what “them” is yet. He clearly has no idea what they are up against and, as you say, just uses the term Xenomorph as a general “there could be non-humans involved”. Nice exploration of what the Alien is known as. ‘Xenomorph’ is as generic as calling a dog an ‘animal’. It’s close but not accurate and as pointed out, could refer to any ‘alien form’ – another interpretation of the word. ‘Murderous Abductor’ is a more appropriate interpretation of the binomial, internecivus raptus. The word ‘raptus’ covers all forms of grabbing, thieving or abduction. It means to ‘take forcefully’ and is contextual to the nature of the seizure. As the Alien takes people, the word abduction is most appropriate. Another issue with either binomial descriptors is neither of them take into consideration the artificial nature of the creature as it was created by Engineers and later replicated (stolen) by David. As far as ‘Foul tongue of Acheron’ is concerned. Personally, I think Ripley is a better candidate that moniker. After all, she’s the one who constantly drops the ‘F-bomb’ in all these movies. lol.